Best Cooling Fans You Can Buy in 2019 and Beyond! With Summer around the corner, people are in for hot days if nothing else. This is especially true if you live in regions like Arizona or Seattle. Trust me, I’ve been on the receiving end of the sun’s heat. I know how scorching it can get outdoors. If your air circulation method is poor, the same thing will happen indoors as well. ACs are pretty good at maintaining proper air circulations. But they have one drawback. That is, ACs will cost you a heap of money to buy and maintain. What if I told you that I’ve got a cheaper and smarter solution up my sleeve? How’d you react if I told you the best cooling fan could function the same way as an AC? Believe me or not, some of the fans of today work “Almost” like an air conditioner. On top of that, they consume significantly less energy. You don’t need as much care in maintaining them either. So, which are some of the top fans for cooling out there and how to pick them? This article aims to answer all these queries of my readers. Undoubtedly, you’ll find these devices scattered around you. There are so many that choosing an ideal one can be a problem at times. Hence, I’ve come up with a list fans of my own. These products are well-rounded in features, performance, and price tag. They should serve you without issues for years to come. 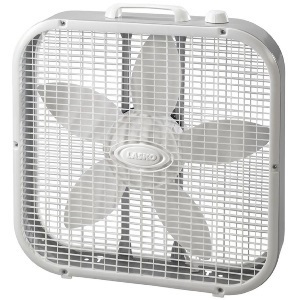 When it comes to starting the list off, I must consider the Vornado 660 Air Circulator Fan. It provides perks that people only dream of having in their air circulators and oscillating fans. As you might have guessed, it is designed to provide air flow throughout the whole room. 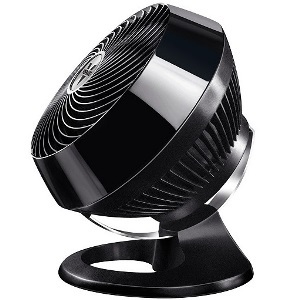 Unlike some fans which provide air flow in one particular direction at any given moment, the Vornado 660 does way more. You might guess from the brand name that Vornado is playing on the word “tornado”. This cooling device is designed to create a tornado inside your room. This tornado will make you feel relaxed and comfortable during this hot summer. The motion of the blades produces a whirl of air that, with the help of the walls of the room. Vortex System makes the air flow throughout the room. The tornado of air (so to speak) hits the other end of the room and then travels back to the fan and on the air flows. With the Vornado 660 in your room, you can enjoy the airflow sitting in any corner of a moderately large room. You can change the tilt of the fan as per your needs owing to a chrome glide bar situated at the base of the fan. The control buttons are conveniently placed on top of the device. There are 4-speed settings ranging from turbo mode to whisper quiet. The blades are contoured. They, along with the Inlet Air Accelerator and Enclosed Outlet Air Duct, provide maximum airflow with their every turn. Vornado 660 is mainly a floor fan, that is, it is to be set on the floor preferably on one side of the room. The position of the tool is crucial for the tornado air action to work satisfactorily. I must admit that this fan is one of the quietest products ever put on show by Vornado. Strong motor takes care of various speed modes of this little fan. It doesn’t give into hard conditions. After seeing how easy it is to clean this Vornado product, users will hardly complain. Vortex motion allows the air to reach all corners of your room without you repositioning the fan. It might be one of the quietest product from Vornado but not the quietest overall. I must admit, this thing is a bit pricier than the others available to the users. I love ceiling fans for a number of reasons. They are inexpensive, easy to set up, and run for a long… long… time. Once set up, getting it down is not a wise unless you need to repair it. I understand Summer can be tough on some people. With immense heat overhead, you need a device that can keep your indoors cool. if you are looking for the best cooling fan out there, you should get the Hunter 53091 Builder Deluxe 5. The best thing about this product is that it provides cooling airflow to every corner of your room. The blades are at a 12-degree pitch that is enough to ensure maximum airflow. 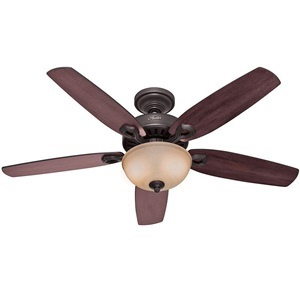 With 5 Brazilian Cherry/Stained Oak colored blades, this fan can make the hottest days of summer bearable. There is a misconception that ceiling fans creak, but that is not the case with the Hunter 53091. Hunter 53091 is designed with Whisper Wind Motor that does not only provide a whisper-quiet performance but also provides a powerful one at that. In fact, the motor is such that it can also run in reverse direction. What is the use of this reverse motor action? Well, normally ceiling fans provide a downdraft air flow (air flows downward; suitable for summers). But when you reverse the motor, the fan provides updraft air flow (air flows upward) that is suitable during cold winters. Hold on! I’m not done yet. This little thing is more than a ceiling fan. It is equipped with Bowl Light kit and Toffee Glass. The package includes 2 60W Candelabra Incandescent bulbs. This Hunter ceiling fan can be controlled with the help of pull chains. The pull chains help you turn the fan on and off and change the speed settings. This thing comes with two Candelabra lights. This allows the users to position it in places that need lights. Installing this piece of furniture is not a difficult task at all! With the competent motor at play, you can even use this product to handle reverse airflow as well. As the story with all my recommendations, this one has a powerful motor as well. People will enjoy the limited lifetime warranty as it safeguards the fan from unforeseen damages. You won’t get a remote with this fan which is a letdown. It operates via a chain pulling mechanism which is not always accurate. With time everything is leaning towards minimalism, ceiling fans included. To meet the demands of the elegance of modern households, Lasko has produced the sleek and sophisticated Wind Curve Fan. It is designed to cover large rooms. Lasko is known for taking up little space and completing your aesthetics. It comes with a remote control with which you can operate all the settings of this Lasko Tower fan. The fan even has a recess in the back for storing the remote control device. “Lasko Wind Curve” has a carry-handle that lets you easily carry it in your house. Although it is 42 inches in height, it weighs something around 12 pounds only. 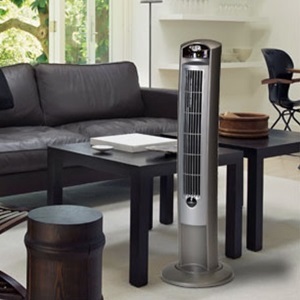 The height, along with the Wind Curve design, plays a big role in helping the fan maximize airflow throughout the day. In fact, the Lasko Wind Curve Fan is designed to be used throughout the year. It also works as a heater during winter. A safety coating (temporary) is put on the heater to preserve it during shipping. Lasko tower cooling fan has built-in ionizers. What these ionizers do is that it spreads negative ions in the air which provide fresh, outdoorsy feeling inside your home. Timer setting allows the fan to shut off automatically after 7.5 hours. Moreover, Lasko is cautious about the safety of the users. You’ll find a “Safety Plug” on board the fan. This little plug cuts off the power supply to the fan if it detects any anomaly in the current or in the motor of the fan. Assembling this fan is no fuss at all. A novice can do it easily within a few minutes. You can tinker with the controls to make the fan shut down automatically from 30 minutes to 7.5 hours later. The ionizers are a cool addition to the package. It provides fresh outdoor-esk air for the users. At a height of 42 inches, this fan covers a large area. It is perfect for large rooms of your house. The safety plug is a nice addition as well; it cuts the power off to prevent any accidents beforehand. I encountered a weird odor while using this fan due to the color coating. The remote control system might take longer to respond than you anticipated. Pedestal fans are considered among the best cooling fans thanks to their simple yet effective design. You may say they are not much in style anymore. But have you looked at the Lasko 1827 pedestal fan which has the word “elegance” as part of its name? You see, cooling fans such as this are widely known for their hassle-free features. This black beauty does not require any assembly. Just open the box and start enjoying the cool, fresh air. This fan can easily cover large indoor spaces with strong currents. It has got three different levels of speed settings that all run smoothly. Like anyone would expect, the operating switches are set up on the back of the fan. The elegant looking Lasko 1827 has optional oscillation features. Owing to this feature, the fan head will automatically oscillate in a wide angle providing gentle to strong breeze to every corner of the room. Lasko has designed this little product with a fused safety plug (like the other models from this brand) that cuts off power supply in case of an emergency. The cool thing is, users can adjust the height from 18 inches to 55 inches, depending on your needs. Not only that but also you can tilt the fan head to help direct airflow where you need it. It is lightweight, only around 9 pounds. So you can easily carry it anywhere. The front grill of the fan head can be detached so that you can easily clean the blades and the whole fan. At an unbeatable price, this one gives you the best value for your money. This pedestal fan is large with an 18-inch size. It easily covers for a large room of an apartment. Despite being a pedestal fan, this little product is easier to move when compared to others. You’d be surprised to know that this thing comes pre-assembled unlike other fans of its league. The height of this fan is adjustable for the user’s convenience. This pedestal fan has some plastic parts that might give in to various risks and malfunctions. You won’t find any remote control with this package. It has limited functionalities. The Ozeri Brezza III is said to boast of its lowest noise level rating among its class. Just use the fan for one day, and you will know if the boasting is justified or not. This fan is powered by the new ultra-quiet motor. This motor offers 4-speed settings and dual oscillation. You can select the speed from gentle to turbo air flow. The 10-inch fan head oscillates automatically both from left to right and up and down. That is, oscillation setting will start working when you switch on the fan. If you want precise air flow, you can manually turn the oscillation setting off. In fact, it comes with a remote control device. With the help of the device, you can operate the fan sitting comfortably in any corner of a moderately large room. This desk and table fan is very convenient and space saving. It is made with light (weighs only 6 pounds) but durable materials. And it has also got a carrying handle. So it is easy to carry and goes a long way. The Ozeri Brezza is easily an intelligent choice to rid yourself of the summer heat. This high-velocity fan is equipped with 4-hour programmable timer settings. When people set up the timer, the fan will automatically switch off after a maximum of 4 hours. The Ozeri Brezza III is made with style and goes with most home decors. The perfectly pitched blades and spiral fan grill help to provide a strong wind current continuously. This is a great oscillating fan for people who want constant airflow in a small room. 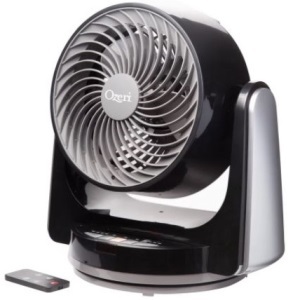 You get as many as four different speeds with Ozeri Brezza III Table/Desk fan. The Price vs. Performance graph is just perfect and to my liking for this fan. This fan is incredibly easy to carry around thanks to the carrying handle it comes with. One can depend on the remote control as he/she can control the product completely with it. Ozeri Brezza III is certainly noisy after it passes a certain time at its lifecycle. Vornado fans are famous for doling out best fans for cooling within everyone’s budget. As you know, Vornado gets its name from the tornado. That is, the tornado-like air flow it is designed to provide. The Vornado 783 Full-Size Whole Room Air Circulator Fan is no different. However, as a Vornado, it is different from other fans because it can circulate air flow inside even the largest room of your house. As a result, you can enjoy a steady airflow in every corner of your room. The Air Inlet Accelerator is specifically sized to direct air to all parts of the blade. The blades have got a comparatively deeper pitch than most fans. The benefit of the deeper pitch is that it helps to provide a stronger and steadier air current. 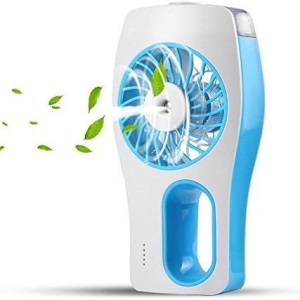 To get the best results of this product, place the fan in one corner of the fan. The fan will produce a vortex of wind that will bounce off the wall in the opposite direction and then get back to the fan. The height of this 783 fan can be adjusted from 28 inches to 40 inches. The Air Outlet Duct is also specifically structured in the shape of a cylinder to turn the air current into a vortex. And the vortex of air finally goes out through the spiral grill and then to every corner of the room. The control buttons are placed on the top of the fan head so that you can easily access it. All you have to do is switch on the fan, select a speed setting (you can select among three distinct speed settings) and then sit down to enjoy a comfortable time at your home. This is one of the quietest of fans that Vornado has put on show thus far. Control panel of this little beast is conveniently positioned at the top for easier access. The air outlet duct of Vornado 783 functions as the key to moving the air all around the room. You have the pleasure of choosing between three different speed settings of the fan. I didn’t find any negatives while testing this model for my reviews. If I’m ever to say that the possible best cooling fan is designed with no blades, will you not laugh at me? I know I would laugh at myself. Believe you me, the Dyson Air Multiplier AM06 table fan is one such fan. It is designed with Air Multiplier Technology. When users first look at the fan, they’ll see a flat hoop placed on a stand. The hoop is the part where the air is multiplied. The hoop is hollow and has internal cavities with two external openings – one opening is on the outside and the other inside. 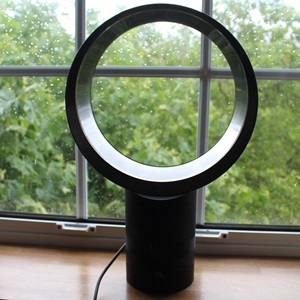 With the help of the said technology, this Dyson fan pulls in the air through the outside opening and then lets out the air through the second opening with a much stronger current. Since Dyson AM06 has no blades, it is perfectly safe for children. And it also makes the fan much easier to clean. This bladeless fan is 75% quieter due to its streamlined air channels. Moreover, it also helps to save 30% more energy as its motors don’t have to run blades. The fan comes with a magnetized remote control device. With the help of this remote, you can switch it on and off, change speed settings, turn on oscillation mode and set up sleep timer. There are 10 different speed settings to choose from and you can set the timer for up to a maximum of 9 hours. Since the remote control is magnetized, one can simply put it on top of the hoop and it will just stay there. Plus, you can also tilt the fan, which you will have to do manually. The design gives you the impression of a high-end fan with an attractive aesthetic. Dyson AM06 comes with a powerful motor that can handle years and years of service. Remote control is also magnetized. You can put it on the fan and it will stay there without moving. Dyson has a technology that can take air in and intensify the current as it gives air back. It saves you valuable energy annually. Dyson is known to save users 30% of electricity bills. You’ll require the remote to make the advanced functionalities work. Despite how well Dyson AM06 works, this thing is expensive according to some of the users. Now, don’t frown your eyebrows, I’ve got another Lasko product at number 7 on my list today. Apparently, these fans are so good that I couldn’t keep another one away from my horde of Best Fans for Cooling you during summer time. This time, it is Lasko 3733 20-inch cooling fan. It as simple as fans can be. But don’t underestimate this Lasko product just because it does not cost much and is easy to get your head around. This is a 20-inch box fan with 5 properly pitched blades. The front and the back grill are both open so that air can flow through it without any hindrance. It is very light in weight (weighs something around 6 pounds) and so it is very easy to carry. It even has a “Carry Handle” on top to assist you. This is an ETL Listed product and it is equipped with a fused safety plug. This safety plug cuts of power if it detects an anomaly. This fan is perfectly safe even for kids! When we get down to speed levels, there are three levels of speed. You’ll have slow, medium, and high level of rotation for the fan. The speed control dial is set on the top of the fan head. All you need to do is to plug the fan in and select a speed setting and then sit down to enjoy a comfortable time. The motor is whisper quiet and runs smoothly even when running at the highest speed. The thing about this cooling fan is that it is designed for targeted air flow. The fan head does not oscillate and it also cannot be tilted. To get best results you would have to sit in line with the fan. Lasko provides users with efficient air propellers that can maintain constant airflow. The fan is encased in metallic frame that protects it from damages and gives it an attractive look. This little fan is ETL listed and has a safety plug that guarantees safety to the users. I’m sure the owners will be happy because of its lightweight nature and portability. It’s not surprising that a Lasko product is noiseless. The motor you see in the fan is whisper quiet. At high-speed levels, the fan produces noises that can be difficult to bear for some people. The Holmes HAPF624R-UC Blizzard fan is a perfect candidate number 9 to be selected for the best cooling fan list of 2019 and beyond. You can set up the fan almost anywhere in your home. Feel free to set it up on your bed, on the table or on the floor. Holmes HAPF624R-UC has an oversized handle that allows you to carry the fan easily. In fact, it is extremely lightweight – some 5.5 pounds only. So anyone can carry it. This is a 12-inch fan with some of the best features. The first one is the rotating grill. 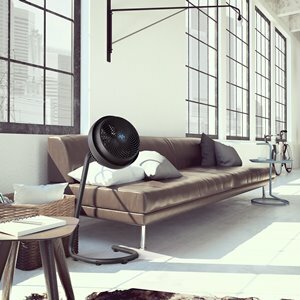 The front part of the grill of the fan head continuously rotates to cover a wide area inside your room. But the fan doesn’t Oscillate unlike some of the other alternatives on my list today. You can even change the direction of rotation of the grill. There are a series of buttons on the front face of the fan that lets you change this setting along with others. 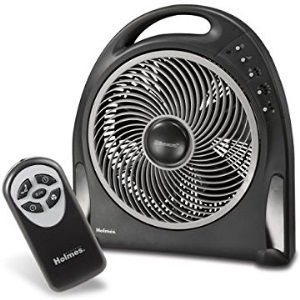 Plus, this Holmes Blizzard Fan comes with a remote control device that allows you to operate all the settings of the fan. This Holmes Blizzard fan also offers sleep timer settings. You can operate these settings from afar using the remote control or directly on the fan head using the buttons. This all-rounder fan is a cost-effective solution to the heat of summer. Users can select from as many as three speed settings. And also you can choose from two breeze settings. You’ll find a box to store the power cord at the back of the fan. The HAPF624R-UC fan will run on any standard AC power outlet of 120V. This little fan helps oscillates the air in two directions (90 degrees to each). One can utilize the sleep timer to shut the fan off automatically when he/she needs to. You get to play with three different speeds while operating with the fan unlike many in its league. One can use the remote control or the buttons on the fan’s head to control it properly. This little product is not complicated at all and runs on 120V AC power under normal circumstances. You won’t find a place on the fan to keep the remote while you are not using it. The control buttons make a loud sound whenever you push them. Comfort and convenience are somewhat synonymous. That is why when we sat down to make a list of best fans for cooling we decided to include the CTLpower Handheld Fan. This is not just a fan but also a humidifier. This 2-in-1 fan is perfect for use after exercise or to help your last a long time. It is a rechargeable fan that comes with a mini USB Data cable. With the help of this cable, you can charge the built-in 2000 mAh lithium-ion battery by connecting the fan to your mobile charger, power bank or even your laptop. When fully charged, this handheld fan can run up to a maximum of 7 hours. You can actually carry this fan when you are traveling. It is to hold and you can also set it up on a flat surface nearby. As I mentioned earlier, this CTLpower product is also a humidifier. The fan comes with a water bottle box that is attached on top of it. To enjoy the humidifier setting, you will have to pour water into it first. The fan runs on three modes – just Fan (runs for 7 hours), just Mist (runs for 5 hours) and Fan plus Mist (runs for 3 hours). There are 5 indicators on the front that show charge, battery and the three modes. I know, water in an electric device may seem risky. But not with this one. The CTLpower Handheld Fan comes with automatic protection. When the fan is running on humidifier mode, it automatically switches off after one hour of use. This little thing comes equipped with a rechargeable battery which lasts long. This little thing can function as a humidifier too if the user pours water into a box and turns the settings on. The humidifier is automatic too. It switches off by itself after running for an hour or so. The term “Handheld” should give you an idea that you can carry the device anywhere you like. I have issues with how little power the motor of this fan generates. To me, it looked more like a humidifier than a full-fledged fan. To be honest, you’ll have to deal with a number of variants when it comes to cooling fans. Knowing how many types there are will help you in getting the proper one for your job. Let me lay out various types of this tool that populate the market. 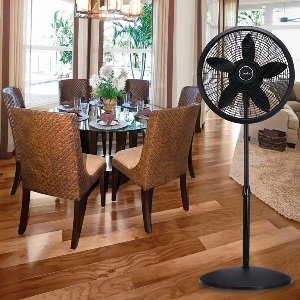 Floor fan is the first and one of the most common varieties around. These things generally operate using AC power. Among all the types, this is the noisiest. Ceiling fans are the next type. The name should give away it’s traits. As you might have guessed, people mount it on ceiling. Although these fans have different price tags, a good fan’s price begins from $150. If you are not satisfied with a floor fan, “Tower” fan is a good option. These things have an intelligent design. The layout of allows these things be noiseless while directing more air to all directions. Pedestal fans fall into the fourth category. These fans have stands to support them while they circulate air. People can even adjust the height of some of these devices. Bladeless fans belong to the fifth category. As the name suggests, these fans don’t have blades. More appropriately, blades are hidden in the base. These products have slits in place of conventional blades. From these, air comes out and is directed at people at high velocity. When it comes to moving air, box fans are the most basic. These things move air in a linear direction. They do it either from front to back or back to front. These are not like oscillating fans that move air all around the room. The last category or type up for discussion is “Table or Desk” fan. A table fan is kept on a table and can move air around in a limited fashion. This has a short range and oscillation angle when it comes to moving air around. You might not realize it yet but there’s a formula for selecting the best cooling fans out of hundreds of alternatives. To put it simply, we look into a number of factors and judge our choices against the said parameters or factors. What are those? Let’s find out. I need not stress the importance of quality materials to you guys, right? A steel-made grille is obviously better than ones that use hard plastic. The former is more resistant to damages and sudden shocks than the latter. Also, steel casing degrades slower than other alternatives. However, steel casing is obviously heavier than aluminum. When you are considering portable fans, an Aluminum casing for the fans is the best option. These fans are lightweight and easy to carry. Each variant of the casing has its advantages and disadvantages. Choose based on what you need. How Many Speed Levels Does the Fan Have? This is an important aspect that you should pay attention to. Not all fans are equal. Some have two or three levels of speed. Others will offer you up to 10 different levels to contend with. Depending on that, the RPM count of the motor varies. A 3-speed fan is good for small to medium-sized rooms. You’d want a fan with more than three-speed levels to cover a large room. People will tell you having four levels of speed is ideal. Personally, I think it’s even better to have more than four levels. Does the Fan Distribute Air Evenly in the Room? Speed is a vital thing when you are cooling a room with fans during the hot Summer days. But strong air current alone won’t be able to do the proper job. The fan “Has to” have the ability to cover the entire area of your room to cool it off. How? By Oscillating, of course. Some of the best cooling fans of my list rotate from 90 degrees to 180 degrees to cover all the corners of rooms. Then, there are some which travel the entire circle. Meaning, these fans rotate for up to 360 degrees. Depending on which products you are into, the oscillating function might or might not be there. So, set your budget and choose wisely. I won’t lie to you, most people will buy an oscillating fan with “Turbo” mode and be happy with what they’ve got. The product usually comes with a fine motor and super-fast speed levels. Cycling through different speed levels isn’t a problem either. That’s until you put the fan on “Max” and realize you can’t hear what’s playing on TV. Yup, sometimes these devices are noisier than others in your house. The solution is simple. Manage the noise levels. The simplest way to do that is to pour more bucks into the purchase. This way, you’ll have a high-end fan with awesome noise compression. Or, you can go for a special kind of tool for the job AKA bladeless fans. These devices don’t have blades installed. Some may argue that these don’t supply you with much air, but they don’t make weird noises either. You won’t have to shout at the top of your voices just to get your point across. Depending on how you picture your needs, you may end up choosing different types of fans. This is entirely normal. You can go for Humidifiers if there are elderly people at the house. Humidifiers score big when it comes to keeping the humidity of your rooms to a manageable proportion. Also, people can go for fans that have water filters built in them. These water filters supply water into the mechanism when the wind blows over. This means the rooms will cool faster and more efficiently than with normal devices that people often buy. Depending on how many functions your device has, the price tag will vary. For example, normal fans cost less than those with humidifiers or water filters in place. Same goes for fans with and without blades. Make sure to determine what you need and at what price to choose the ideal one. When you consider the best cooling fans, options are unlimited. With a number of categories, users won’t be in a bind when choosing one. If you want a quieter option, go for the tower fans. These fans possess brushless motors that make less sound while operating. If air circulation is your primary goal, go for a box fan. I’m sure a table fan or a floor fan would do just fine when it comes to smaller rooms. Since I’ve compiled the list of Top 10 products, you won’t have to look anywhere else. But if you want to give it a try yourselves, my buying guide will surely be helpful.